William Cavendish, fourth Duke of Devonshire, served as a stop-gap First Lord of the Treasury during a period of intense political crisis. He was born in 1720, the eldest son of William Cavendish, third Duke of Devonshire, and his wife Catherine (née Hoskins). Initially educated at home by tutors, he, like many young aristocrats of the period, completed his education by undertaking the Grand Tour to France and Italy. Devonshire was elected as MP for Derbyshire in 1741 through familial interest. Inheriting his father’s staunch support for the Whigs, Devonshire worked hard to support Walpole in the dying days of his administration. Following Walpole’s resignation in early 1742, Devonshire shifted his support to the Old Corps Whig grouping, led by the Duke of Newcastle, his brother Henry Pelham and the Earl of Hardwicke. He remained loyal to them throughout their, ultimately successful, struggle to displace John, Lord Carteret in George II’s affections. In March 1748 Devonshire married Lady Charlotte Boyle, the only surviving daughter of Richard Boyle, third Earl of Burlington. Following Burlington’s death in 1754, the Devonshire estate and political interest were increased considerably, with lands and parliamentary seats in Yorkshire and Ireland and Burlington House in Piccadilly. Devonshire left the Commons in June 1751, taking a seat in the Lords as Baron Cavendish. He promptly was appointed to the Privy Council and became Master of Horse in the royal household. The intermingling of government and court offices in this period meant that the latter office also enabled him to attend meetings of the key ministers. Following Pelham’s death, he continued to serve in Newcastle’s administration and was appointed Lord Lieutenant of Ireland in March 1755. Irish politics in this period was divided between supporters of the administration and a patriot faction, keen to demonstrate independence from London. Devonshire was an Irish landowner himself and had ties through marriage and friendship with both sides. By opting to spend time in Ireland himself he neatly avoided the disputes that typically arose around the appointment of the Lords Justices, who administered Ireland during the Lord Lieutenant’s absence. Devonshire’s father died in December 1755 and the dukedom passed to him. He remained in Ireland until October 1756 when the political crisis triggered by the outbreak of war with France and the loss of Minorca was reaching its height. Following Newcastle’s resignation in November 1756, Devonshire was asked to form an administration with William Pitt the Elder. As in Ireland, Devonshire hoped to reconcile factions and bring people together. 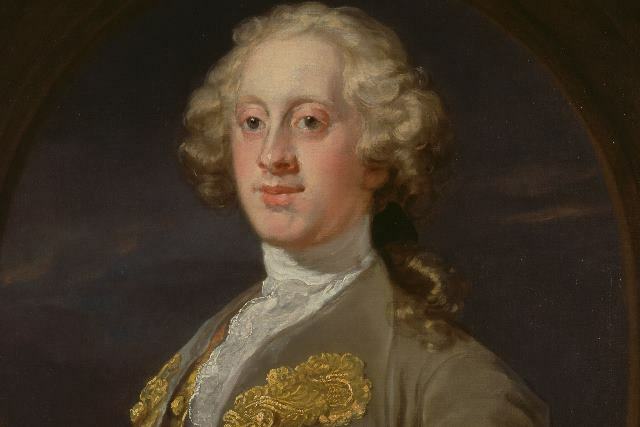 It was widely felt that his tenure as First Lord was temporary: ideally, some sort of new arrangement needed to be reached between Newcastle, Pitt and George II. By April 1757, George had grown tired of waiting for Newcastle to come back into the fold. He sacked Pitt, provoking a protracted period of negotiations which Robert Walpole’s son Horace called the ‘interministerium’. By late June 1757 an accommodation had been reached and Pitt returned as Secretary of State, while Newcastle resumed office as First Lord of the Treasury. Devonshire became Lord Chamberlain but continued to attend ministerial meetings. Following Newcastle’s second resignation in May 1762 over the conduct of the war and the growing problem of Lord Bute’s influence on the King, Devonshire did not resign himself but refused to attend meetings. This led to him losing office in November 1762. He died at Spa in Germany in October 1764. An inveterate builder of political bridges, his career illustrates the importance of connection and tact for political success. Militia Act 1757: established militia regiments in all counties in England and Wales, reviving the system of home defence that had been in abeyance since the Civil War.